Toronto – June 30, 2014 – Marking the pinnacle of more than nine days of celebrations, UFCW members from across Canada and the United States united with hundreds of thousands of marchers on the streets of Toronto for the largest global Pride Parade ever held in North America. Toronto – June 28, 2014 – On June 28, Canada’s leading and most progressive union hosted an impressive arts and music extravaganza at the Sheraton Centre in downtown Toronto that served as a feature occasion for this year’s historic World Pride festival. Toronto – June 27, 2014 – On June 26, more than 200 couples from around the world took their wedding vows during the Celebration of Love – the largest LGBTQ wedding Toronto has ever seen. 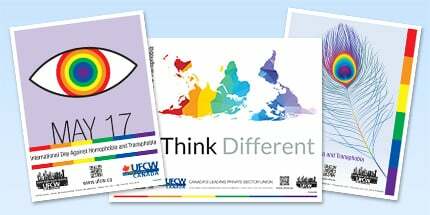 As Canada’s most progressive union, standing strong for our LGBTQ members everywhere, UFCW Canada is proud to support the Celebration of Love and all World Pride 2014 events. Toronto – June 26, 2014 – UFCW Canada is excited to welcome Mariela Castro, a renowned human rights activist from Cuba, to World Pride 2014. Mariela is one of many honoured guests participating in the labour-themed LGBT Pride showcase – Come and Celebrate Your UFCW Pride – happening this Saturday, June 28 in the Sheraton Centre Hotel at 123 Queen Street West in downtown Toronto. Toronto – June 26, 2014 – Pride Week is finally here. UFCW Canada has worked hard towards a tremendous show of solidarity and celebration, and would like to share our plans about the various activities that our union will be participating in throughout the week — culminating in what is expected to be the largest Pride Parade ever held in North America. Toronto – June 25, 2014 – Canada’s most progressive union welcomes U.S. President Barack Obama’s announcement that he will sign an executive order to stop federal contractors from discriminating against LGBTQ workers. As a leading participant in World Pride 2014, UFCW Canada calls on employers everywhere to permanently put an end to bullying, discrimination and harassment against our LGBTQ sisters and brothers.